Dodging Environmental Bullets When You’re the Tenant, and the Lease Clause Critique: Three Pro-Tenant Asbestos and Environmental Liability Clauses. Nearly everyone who has ever heard of CERCLA knows that industrial tenants need to be concerned about environmental liabilities. When they use hazardous materials on properties they lease, industrial tenants are strictly liable for any environmental contamination they cause. Responsible industrial tenants don’t have a problem with that notion—they just don’t want to get stuck for pre-existing contamination or for contamination caused by somebody else. But environmental liability is not the exclusive domain of the industrial tenant. Even office and retail tenants must protect themselves from environmental liabilities in the lease, especially when leasing space in older properties. That’s because such properties sometimes contain asbestos and PCB’s. Landlord warranties that the premises contains no asbestos or PCB’s. Certifications from independent consultants hired by the landlord that the premises contain no such materials. Landlord obligations to remove and dispose of any such materials if they are subsequently discovered. Rental offsets for damages sustained by the tenant if such materials are discovered. Term extensions for the length of time it takes the landlord to remove and dispose of the stuff. For the industrial tenant, the scope of environmental liabilities is considerably broader. When an industrial tenant leases or ground leases industrial property for chemical or manufacturing purposes, it must protect itself against contamination present on the property caused by former owners, landlords or tenants. Make a thorough inspection of the premises prior to signing a lease. Request environmental disclosures from the landlord and prior tenants (if such tenants are known and available) in the form of comprehensive questionnaires that cover the prior industrial uses of the property. Disclosure statements can also cover any landlord knowledge of prior hazardous substance spills or contamination uncovered during the landlord’s negotiations for the acquisition of the parcel. Conduct a meticulous physical investigation of the site, possibly with the help of environmental consultants knowledgeable in hazardous substances and toxic materials, if necessary. Physical investigations can concentrate upon obvious evidence of contamination (e.g., unusually colored earth, unusual odors, storage drums, and ponds or reservoirs of industrial materials), but should also pursue types of contamination upon the site that are not so obvious to the senses and which require sophisticated monitoring and testing equipment. Confer with state, federal and local environmental agencies concerning any contact they might have had with owners or prior tenants on the site. This would include contacting the Environmental Protection Agency to determine whether it has any data concerning the site, contacting the state Environmental Protection Agency, and any state or local agencies charged with policing industrial discharges, clean air, or clean water. Finally, local fire departments are often a good resource concerning chemical manufacturing operations in their immediate area, and may have data on particular manufacturing operations in their area of service. Search recorded documents for names of prior tenants engaged in chemical or manufacturing operations as disclosed in deeds or memoranda of leases. Commission a thorough report by sophisticated consultants which inventories the site and relates soil samples to various locations on the site. This sort of environmental report and soil inventory is extremely useful to the tenant to document the condition of the site prior to the tenant's possession, especially if future environmental enforcement actions arise. Obtain an indemnity from the landlord for the costs of cleanup relating to contamination which occurred prior to the possession of the tenant. Such indemnities can be contained in the lease or in separate documentation, but in any event must expressly survive the expiration or sooner termination of the lease and the sale of the property by the landlord. Require the landlord to give the tenant copies of all notices or inquiries from agencies concerning contamination at the site prior to the tenant’s possession. If the lease limits the landlord's liability to the landlord's interest in the property, exclude any environmental indemnities given by the landlord from that limitation. In industrial park situations, consider excluding any costs and expenses of any environmental cleanup or compliance actions not relating solely to the actions of the tenant from the pass through provisions of the common area clause or the operating expense clause in the lease. Think about including language in the lease which requires an environmental inventory at the expiration or sooner termination of the lease to establish and document the condition of the property when the tenant surrenders possession. This may be extremely useful for the tenant in the event the landlord or his successor claims in the future that the tenant contaminated the property during the lease. It may also be wise to have such an inventory performed when any change of possession of the property occurs, such as with an assignment or sublease of the premises. Consider rental abatements for the tenant in the event the landlord undertakes a cleanup of the site for contamination not caused by the tenant’s activities. Consider reimbursements to the tenant if the tenant must cease operations due to any landlord cleanup of the site for pre-existing contamination. Negotiate a clause in the lease requiring the landlord to give the tenant a release for environmental liability at the end of the term if certain express conditions are met by the tenant. Clause #1, which addresses the concerns of an office or retail tenant leasing space in an older complex. 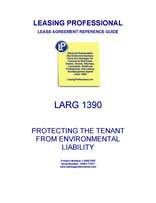 The clause protects the tenant in the event asbestos or PCB’s are subsequently discovered in the premises. If that happens, the landlord (among other things) is obligated to remove the offending materials, and to reimburse the tenant for any costs it suffers during the process. Clause #2, designed for an industrial tenant, which contains an extensive indemnification from the landlord in favor of the tenant pertaining to contamination of the premises by persons other than the tenant. Clause #3, also designed for an industrial tenant, which contains comprehensive warranties by the landlord related to hazardous materials present on the premises prior to the commencement of the lease, together with an indemnity from the landlord for all contamination discovered on the property not placed there through the negligence or intentional misconduct of the tenant, or its agents or employees.